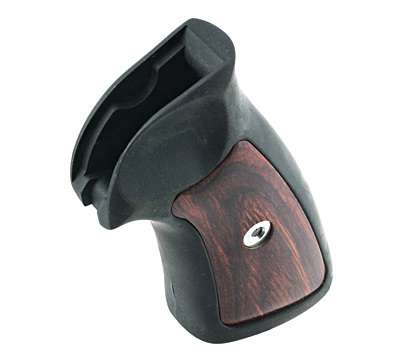 One-piece rubber grip with rosewood-colored inserts for GP100®. Height is 4". May fit older Ruger® Super Redhawk models, please call before ordering. This is a engineered wood product; color of wood grain varies. My GP100 came with the Hogue grips. Those are nice grips, but seemed a little skinny in my hands. Switched to these grips, and the feel is rock solid. Same when youre putting a steady diet of magnum loads through it as well. Took all of 5 minutes to install. While some say they look a little old school, they look and work great in my opinion. Absolutely love them. Feels great and pulls from the holster without any snagging. I would grip tape the soft rubber portions. My GP100 snubbie came with the compact version of this grip. Great for concealing, but a bit too small for my hands. When I got this 1/4 inch larger version, I was very impressed with the quality and fit. It prints a bit more under an untucked shirt, but is much easier to hold shooting .357. I may order more for my longer-barreled GP100s. Received these grips today 70083. There is no stainless screw for the handle. Found a tiny ugly metal rust someday screw recessed far into the grip with exposed threads on one side. Very crude, looks like a mistake for sure. Something went wrong here, these should be free. This may be a return item since it is also scuffed up so maybe someone switched parts. The black grips that came with the GP100 did not fit my hand well. With finger contours one size does not fit all. I ordered this original style and it was much better and looked better. Easy to install. I was disappointed that the panels were so mismatched. Ruger did state that the grains could vary. I was not expecting such a difference. On mine, One panel was beautiful and one was dark with almost no grain. Altamont Co. makes these panels. I found out they have other styles for it also. I was able to get a checkered pair that give an even better grip when shooting 357 mags. If not for the severe mismatch of color and grain on mine, I would have rated it 5 stars. Just bought a GP100 .357 special Talo edition with the non-fluted cylinder. It came with the wooden grips. They just did not due the gun justice. I put these grips on it made a world of difference in the way it fit my hand and they look wonderful. This is what the GP100 should have come with standard. Installation took about 2 minutes. Very easy. I dont have large hands. I purchased my first GP100 fourteen years ago. I found the original grips to work best for me. I let the first GP100 get away from me several years ago. When I purchased another one I was disappointed to learn that Hogue grips were now standard. Hogue makes a good product but I like the old grips. Nice to have them back. Feel great, look great. The standard Hogue grips are nice, but THESE should be the ones the pistol comes with. Better than the factory grips. i bought my GP100 new and was hesitant about the HOGUE black rubber grips that came from the factory. I dont see why they put large grips on a medium frame revolver. The new grips were instantly better. Makes the revolver easy to handle and looks 100% better. Defiantly a purchase im proud of. Once again my GP-100 looks and feels like it was meant to. I really like this grip! Highly recommend it. I recently got a gp100 in .22 lr. Fantastic revolver and it came stock with these rosewood grips! I also have a gp 100 in 357,but it has this nasty hogue grip with finger grooves. Its so so but im not crazy about the way it looks and feels. I orderd this to put on the 357 and it gives it that 1980s look real striking. Looks and feels so much better,gives you lil more to hold onto.,Id reccomend this to anybody. Ruger should go back to this old setup probably would boost sales. I am extremely happy with these grips. They fit my revolver perfectly, and the rosewood panels have very nice grain and rich color. 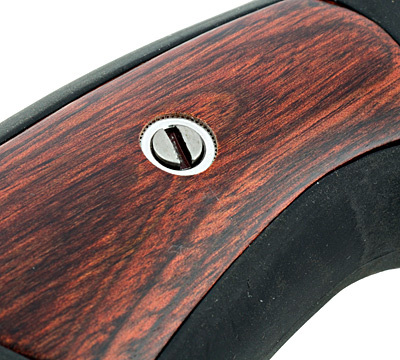 The combination of rubber and wood panels are great at absorbing recoil while at the same time looking very classy. I received them in about a weeks time and I am 100% satisfied. Great job Ruger! Perfect fit. Now my new GP100 looks like its supposed too! Doesnt fit the latest Super RedHawks. The aluminum dowel in this grip is WAY too big to fit my recently purchased Super RedHawk. If I were to machine the hole bigger so it would fit, it would weaken the grip stub of the gun and render the gun incompatible with the old and other third party grips. I do like it however, so will see if Ruger has a smaller diameter dowel that will work. It wont work well without a dowel. Thank goodness these are back! These grips are far superior to the hogue grips that come on the gp100. These have cushion and a better feel, and just plain look better on the gun. 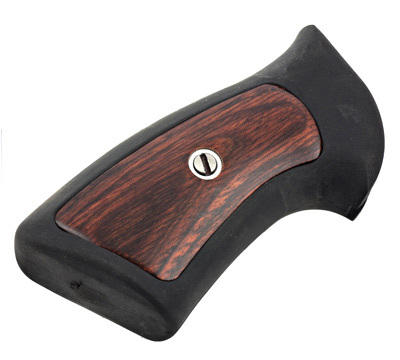 The hogue grips are decent, but they are pretty much hard plastic with a thin rubber coating. The little slot under the side panel to store your take down pin is a huge plus! And it comes with a spare pin! Thank you ruger for bringing them back! I have watching for these grips to get back into stock and as soon as I saw them in stock, I orders two sets. I got them in and they look and feel great on my 4.2 inch and 6 inch GP100s.